Akampan, who was at the battlefield at the time of Khara's death, rushed to inform Ravana. 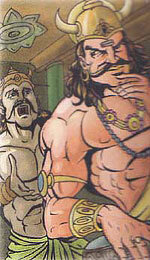 Ravana trembled with anger while Akampan narrated the incident. He demanded to know the name of the person who dared to kill his brothers and injure his sister, Shurpanakha. Frightened, Akampan told him about rama and the powers he possessed. Ravana wanted to kill Rama immediately but Akampan warned him. He said that Rama was very powerful and so they had to think of a plan to kill him. He informed Ravana about Rama's beautiful wife Sita. He said that both Rama and Sita loved each other deeply and if Sita was harmed in any way, Rama would surely come to save her. Ravana liked Akampan's idea very much and decided to abduct Sita.